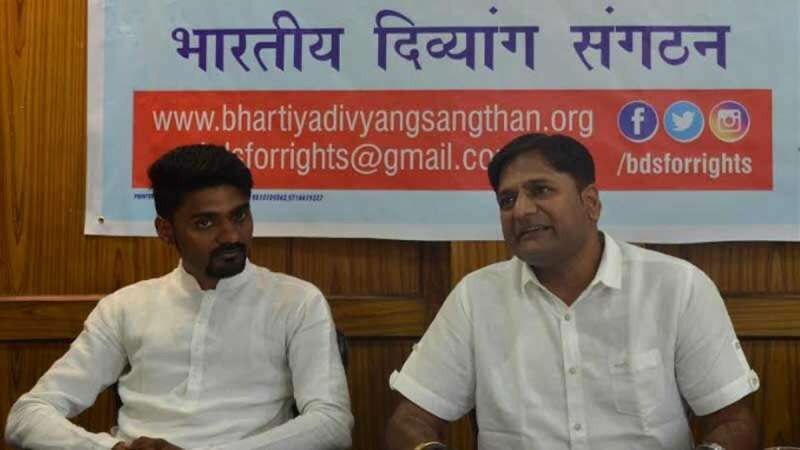 New Delhi : Bhartiya Divyang Sangathan (Indian Specially-Abled Organisation) held a press conference on Thursday to draw the attention of the government towards the struggles of the differently abled. Renowned Divyang volunteer and president of Bhartiya Divyang Sangathan, Amit Kumar, while interacting with the media persons said, "Prime Minister Narendra Modi's effort has ensured that people with disabilities being called 'Divyang'. This move has certainly given them some respect but people with disabilities are not treated equally in society. There is still a lot to be done to change the perception of the society towards Divyangs." "The governments in the past have always made schemes for improving the lives of the specially-challenged people but most of them were restricted to the files and never reached the surface. However, the Modi government has done a lot of positive work towards the upliftment of the specially-challenged people, but there's still a lot of work needs to be done. The incumbent government will have to show more passion," he lamented. Amit Kumar stated further, "Divyang people have shown tremendous skills and character and have even performed better than the normal beings because God gifts them with an extra sense or strength when some part of their body gets dysfunctional. "Due to the efforts of our Prime Minister, the Divyangs are getting technical aids like electronic sticks for the blind, hearing equipment for the deaf, study materials in Braille, smartphones, acupressure machines, and motor vehicles. But a lot still needs to be done to improve the lives of the people with physical disabilities." As per the 2011 Census, there were around 3 crore people in the country with physical disabilities and around 12 crore family members dependent on Divyangs. According to Amit Kumar, the general elections are approaching and there is a margin difference of voter per cent between the winning and losing party. Therefore, a strong vote bank of 12 crore voters would make a difference for any party. Amit has demanded that pension must be given to the Divyang people depending upon the degree of disability. Only Divyang people must be hired at the government and private jobs suiting them. The seats vacated by a Divyang must be awarded to the skilled Divyang candidate. Their education from primary to graduation must be made free, free transport and free medical facilities. They should also get concessions on air travels as well. Every political party must reserve two seats to the Diyang people while distributing election tickets so that Divyangs get representation in the legislation as well. Amit Kumar hails from a lower section of the society but is a successful businessman today. He's a big admirer of Prime Minister Narendra Modi and greatly influenced with his ideals towards Divyangs. In 2006, Amit Kumar was conferred with the Unilever Entrepreneurship Programme Award. He was felicitated by Symbiosis University for his management and direction skills in 2009. He was also honoured by RMIT University, Vietnam, for his thesis on the relationship between a company's top leadership and employees. In 2016, he prepared an Ayurvedic product named 'Hero Mix' to help the people quit smoking and consuming tobacco. 1. Pension to Divyangs on the basis of their degree of disability. 2. They should get jobs in government and private offices that deems fit to them, such as - lift operators, receive and dispatch department, receptionists, IT department. 3. The seats vacated by a Divyang must be awarded to the skilled Divyang candidate by running a specific Divyang-only campaign. 4. Every public and the commercial building must be wheelchair friendly and there should also be a map clearance rule. 5. The government should promote the industries which aim at only hiring people with disabilities at the tehsil level. Give subsidy and funding policy to the industries run by Divyangs. 6. A provision of Divyang Card which ensures free education from primary to graduation at government and private institutions. 8. Free medical facilities to Divyangs. 9. Free ration to the Divyangs, depending on their economic status.